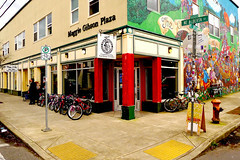 This holiday season, find great gifts at our shop for the bike lovers in your life and save big! We’re offering three types of gift packs – Commuter, DIY, and Upgrade. Each category has dozens of items to choose from. Shop from November 15th through December 31st and save big! 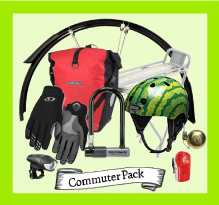 Commuter packs include dozens of items for the bike commuters in your life – lights, locks, fenders, helmets, pumps, gloves, and more. It’s no surprise that this was 2011’s most popular gift category. Great gift ideas for the friends and family in your life that enjoy maintaining and servicing their own bicycles. 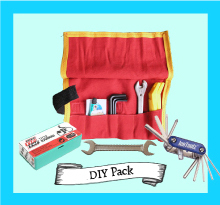 Tools, patch kits, bike wash, and more. Help keep their bikes running smoothly with these products. Along with our old favorites, we have a new gift pack this year. It’s called the upgrade pack. 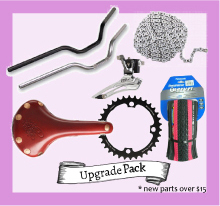 It includes all new parts in our shop over $15. So, if you’ve been waiting for a deal on a nice set of wheels, some flat resistant tires, or a drive-train upgrade, now is the time. We also have super-fast turnaround (most can be done same day) on service right now, in case you don’t want to get your hands greasy. How does it work? Well, each gift pack type will be color coded in the shop. We’ll label everything and make it easy for you.